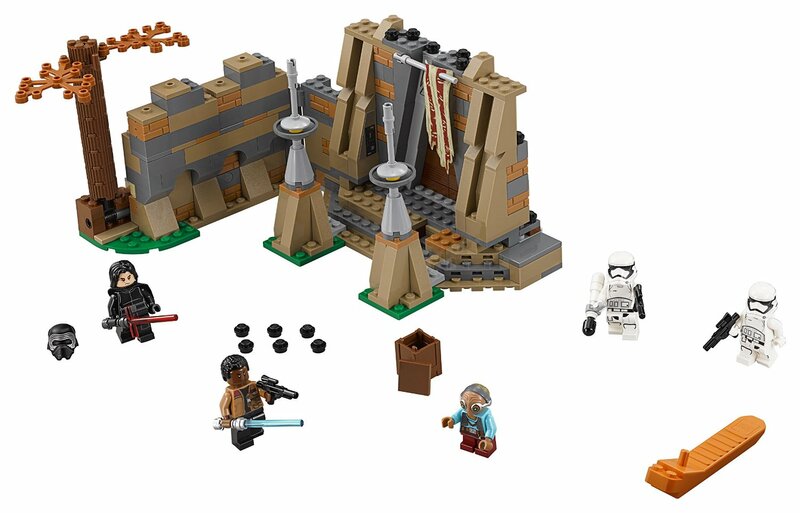 LEGO Star Wars set, LEGO Star Wars Battle on Takodana 75139, is one of the larger releases for the 2016 First wave and it also has a great mixture of characters. While other sets from The Force Awakens have had either light or dark characters (i.e., either Resistance or First Order), this has a selection from both so kids can play at battling their chosen side. And on that point, it’s the first legitimate ‘playset’ of the series (May there be many more :0) ). There isn’t a whole lot to the playset itself, a few walls and a tree that can fall, which takes down the overall appeal but, to balance it out, there are a few choice mini figures that take it into appealing territory. While the official press release outlines that there are two First Order Storm Troopers, fans will know that one of them is, in fact, the character TR–8R. This particular storm trooper, who has become an overnight sensation in fandom, had a fairly minor role in the film but is memorable because he knows Finn, calls him a “Traitor” and wields a weapon that can take on a lightsaber. Pretty cool stuff. As mentioned earlier the playest itself includes an ‘action’ feature – a tree that falls once a lever is pressed and a series of walls meant to recreate the cantina/temple owned by Maz Kanata. The colors are nice and the banner adds to the feel but I guess, as with most LEGO playsets, they could have added a few more generic bricks without breaking the bank too much. All in all, it’s a good set, especially if you are after the figures but may be a pass if you prefer to collect the vehicles.